Hopefully you all enjoyed our article on the history of stenography as related to the technologies court reporters utilize in the industry of their craft. The information as well as all the related photographs in that article came from The Gallery of Shorthand in the Alfonse M. D’Amato Federal Courthouse located in Central Islip, New York. There, I also interviewed Dominick M. Tursi, the Creator and Director of the Gallery who was happy to answer some of my questions. What was the original intent when coming up with the concept for The Gallery of Shorthand? I wanted to show the relationship of society to shorthand. It’s an underappreciated art form. One of my goals was to create a better awareness among non-reporters on what it is that reporters do. Was it a large collaboration? I interviewed about six different design companies, and found one that was passionate about the concept of telling the story of shorthand. The graphic artist played an important role in helping me tell the story in a pleasing way. What would you say is especially important and/or unique about the Gallery? It’s the only public display of the history of shorthand. I’m proud of it. I’ve had visitors come in and weep because they didn’t realize they were a part of something so significant. I think it’s key that The Gallery also makes reporters feel good about themselves. What made you decide to become a curator? Curator? No. I was just a collector of antiquities. When given the opportunity to display my collections in The Gallery, it was a byproduct. Aside from technology, has shorthand changed much over the years in relation to purpose and implementation? No, it hasn’t. Shorthand has always adapted to society. It’s a 5,000 years-old profession. This explosion of change in the last 150 years is just a blip. Shorthand writers have filled many roles. Realtime is a nice byproduct, but closed captioning and CART reporting have been the major changes I’ve seen in my lifetime. Those are real benefits to society. What would consider the defining exhibit of The Gallery? The mission statement out in front. I put a lot of thought into it, and it says what I believe. I also enjoy putting together what I call the “personification exhibits.” Court reporters are transparent, which is how it should be, but that transparent person is still a person. Reporters are people like you and me. I wanted to remind people of that. The “How They Do That” exhibit. A lot of visitors consider it magic. They think of it as mystical. It helps me to convey some of the feelings I have about shorthand. My next project is a think-tank on the state of court reporting for future generations. I’m also writing a second book (The Legends of Shorthand was his first), The Second Oldest Profession. Walking through The Gallery, for me, was a nice trip through time as focused on the perspective of a profession that is not exactly glorified as it was before literacy and writing became more widespread and common in Human civilization. The ancient Sumerians considered scribes to be among the most valued members of society, and I think we should bring a lot of that sentiment back in honor stenographers, court reporters, and stenotypists do every day to help make conducting the business of law an easier pursuit of the truth. If you find yourself in Central Islip, New York, take some time to stop by the Alfonse M. D’Amato Federal Courthouse to see The Gallery of Shorthand, located just inside the main entrance. It’s not too far by train via the Ronkonkoma Line out of Penn Station in New York City. I believe you’ll enjoy the learning experience whether you are a court reporter or not. “The affairs of a society, its organizations and governmental bodies, can be scrutinized only when its discussions are memorialized in an accurate and impartial writing. 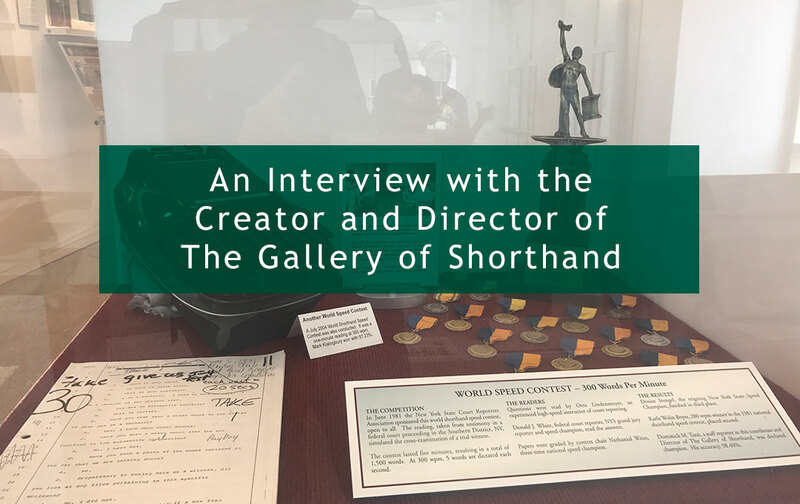 In The History of Court Reporting and Stenography, we discuss more from our visit to The Gallery of Shorthand. Adam Brooks is a legal videographer and client support team member at Brooks Court Reporting, based in Mississippi, and Realtime Advantage, based in New York City.